Were you able to guess what’s in the photo? Of course, NOT! I bet you thought they were mashed potatoes. Well guess again. If you’re like me you’re already thinking how you need to start watching what you eat before the holidays come in full force. I’ve definitely overdone it with candy just since Halloween which was only 2 days ago. Now I’ve got to start thinking about my menu for Thanksgiving. The total carb holiday! OMG! Well here’s one way you can reduce that carb intake for those at your table watching their waistlines decrease rather than increase. Try making this unbelieveably delicious Mashed Cauliflower dish. That’s right. Mashed Cauliflower. If I didn’t try it for myself I would have never guessed it would have tasted so heavenly. In fact, when I made them this evening I found myself going back for seconds then thirds and finally I had to put them away. Otherwise, I would have eaten what was left. Afterall, there’s just two of us now, not a house full. So leftovers go a long way. 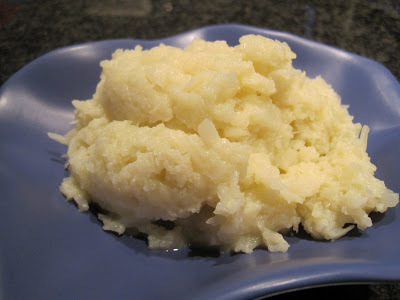 This recipe couldn’t be easier and rather than loading up on the carbs whether it’s for Thanksgiving or any meal for that matter, why not try Mashed Cauliflower? You might even fool your guests, that is, until they take a taste. But I think they’ll love them. Cut cauliflower into florets and place in a medium size saucepan. Cover and heat to boiling over medium high heat and boil for approximately 20 minutes or until the cauliflower is fork tender. Drain cauliflower well. Place cauliflower back into the saucepan and mash well with a potato masher or use an immersion blender and blend until smooth. Stir in parmesan cheese and serve. Surprisingly delicious! Try it – I think you’ll like it.